ProMedUSA+AtmosAir Singapore - ProMedUSA - Products that really work. Enjoy Swiss Mountain-Top Fresh Air! 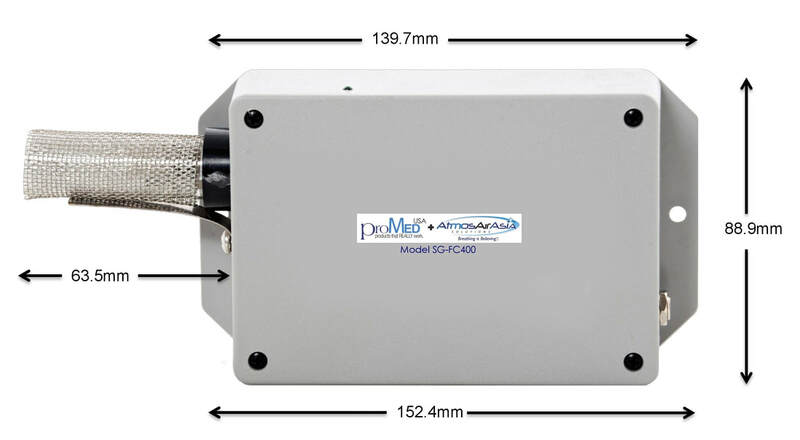 PM0.3 particles and VOC's from the indoor air that you breathe. The SGFC-400 - Small, designed to be easily mounted in an AirCon or Cassette. It can remove odours, mould, mildew, haze, smoke, PM2.5 particles from a room quickly and silently. The SGFC-508 was designed to be installed in large AHU's or duct systems. Extremely effective at improving IAQ by eliminating and killing VOC's, odours, mould, mildew, germs, viruses, bacteria, haze, pollution, smoke, PM2.5 particles - quickly and permanently. Multiple units can be installed to cover enormous spaces like sports stadiums. The SGMH-880/882 FOR MEDIUM SIZED SPACES UP ​TO 180 SqM. The ProMedUSA AirPro-1 is Asia's first portable Bi-Polar Ioniser. Weighing about a KG, the AirPro-1 can rapidly remove odours, mould, mildew, germs, bacteria, haze, smoke and PM2.5 particles from a room. The ProMedUSA SGMH-880/882 Bi-Polar ioniser is engineered for direct placement in an aircon duct, or mounted using a wall mount to eliminate odours, mould, mildew, germs, bacteria, haze, smoke and PM2.5 particles from a space of up to 180 square meters.